Blogger is one of the top free blogging platform which provides a lot of flexibility, advance features, free web hosting, free domain and SEO friendly in nature. Blogger or Blogspot being a part of google and blogger blog easily get index on google. Blogspot provides so many simple templates to design your blog but if you want to attractive look, SEO friendly, Responsive and custom layout of your blog then you have to go for either premium or free templates available on other websites. There are many template websites available on the internet that offers free as well as premium templates. In this article I'm sharing a collection of Blogspot templates which are premium looking and these premium looking templates are absolutely free. Most of these custom blogger templates are adapted from WordPress themes and they will give you professional and attractive look. All these templates are very fast loading, responsive, Fully SEO Optimized, Adsense & users friendly with good design. Some other features- Responsive to mobile, SEO friendly, Easy to customize, user friendly, fast loading speed, less page size, high adsense CTR, Social sharing buttons and free of cost. 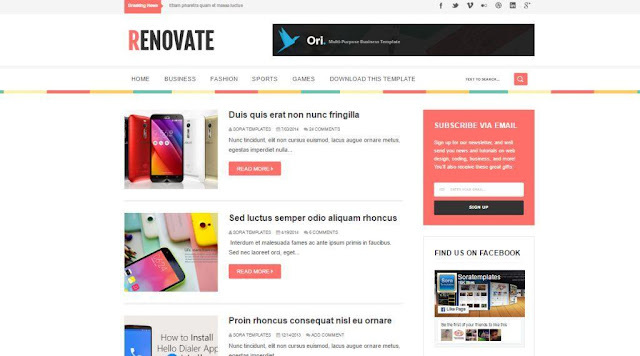 Sensational templates is a ultra responsive 2 column blogger template is professionally designed and Search Engine Optimized by chandeep from Blogtipsntricks. It have 2 navigation menu bar (stylish vertical & horizontal) and purely neat and clean template adopted from WordPress. > Mobile & User friendly. > 4 Column Footer Widgets. Spike is a blogger template suited for blogs with which have contents like How-To Guides, Tips & Tricks, Educational or blogging related. 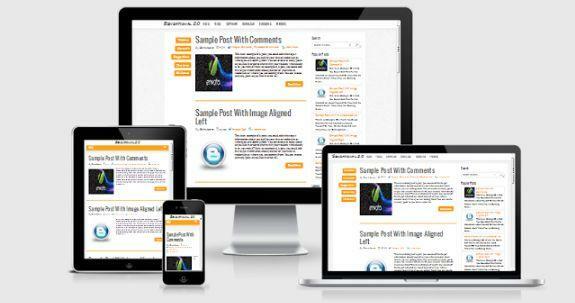 This template is fully responsive and Search Engine Optimized. This template is adopted from WordPress. Read This: >> How To Recover Deleted files and Add Recycle Bin Feature on Android. 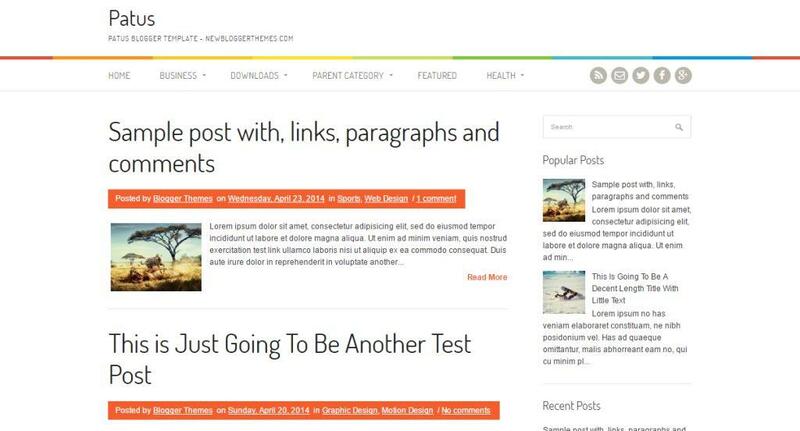 This is one of my favorite blogger template. This template is highly adopted from WordPress. 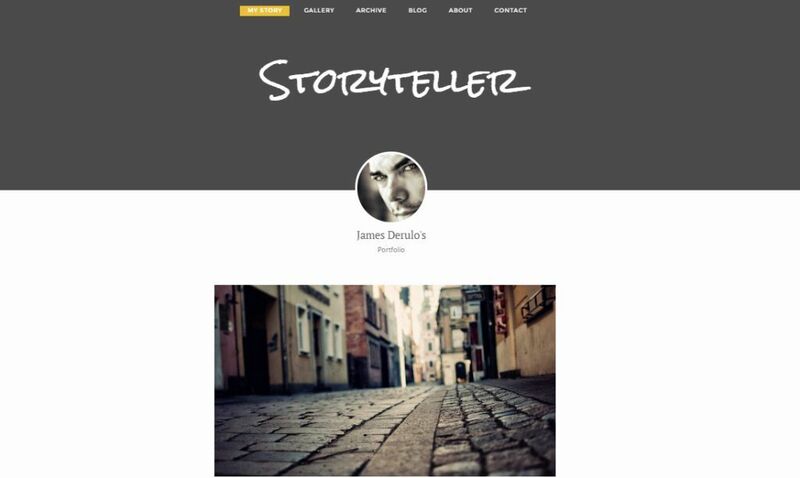 It is a simple blogger blog theme ideal for many types of blog. Patus has status menu Bar and awesome front. This theme is social media integrated and look very beautiful in all device. 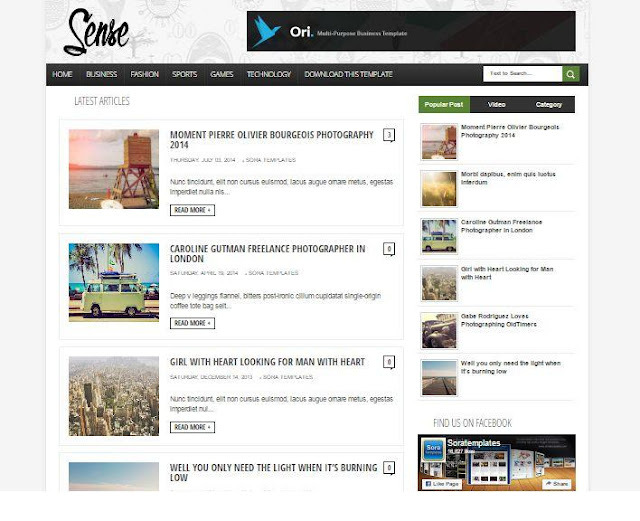 Sense template is a fresh, modern and east-to-use blogger theme with flexible and responsive layout. Sense is suitable for any kind of personal, travel, hobby, life style, magazine and tutorial blog. Installing and customizing this theme is very easy. Unlike other template Minimag has got some extra eye catching design which looks really great. It is best and ideal for Fashion, Tech, News and Magazine blog. Minimag comes with pre-defines highly optimized Responsiveness and SEO ready template. Features: >SEO Ready >Attractive Design >Label Navigation >Highly Responsive >Nice Ad Placement. If you like simple template with elegant and WordPress look then it is best suited for you. It has beautiful social buttons with search box. It has two column layout & auto read more option. This template is really eye catch design & color. 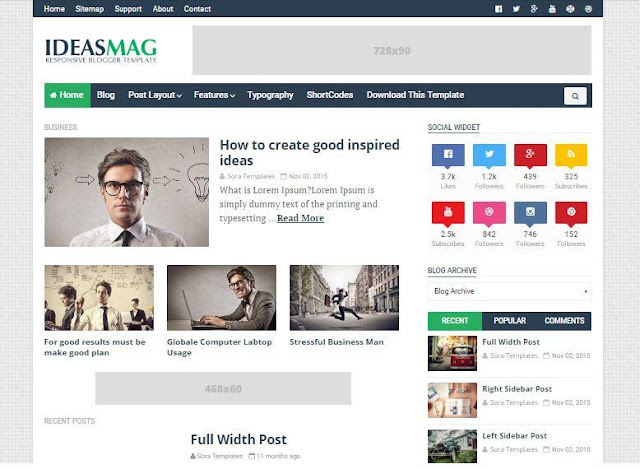 Ideas Mag is a simple blogger theme design both for personal blogs and big news portal website. This is a clean template with less complexity. Storyteller is a responsive blogger template which is specially made for story blog. 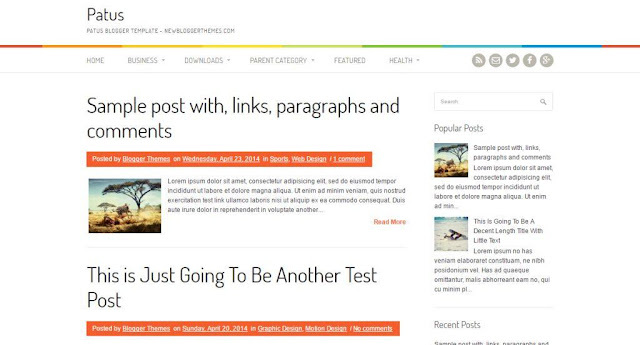 It is fast loading blogger template with simple and elegant look. It is easy-to-use and easily customizable. Food blog is a blogging theme with a focus on food. The built in recipe builder makes it incredibly easy to share recipes with your readers. 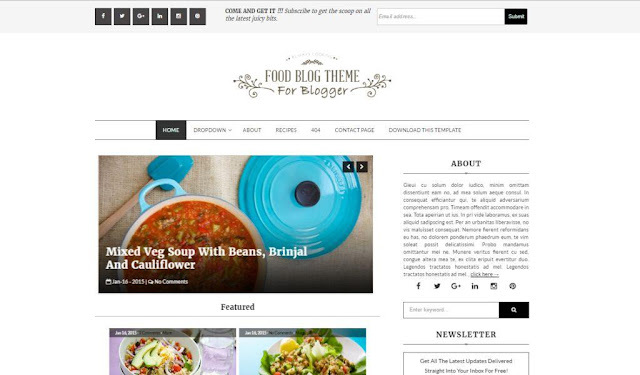 Food blog template helps to showcase your beautiful food with huge post images and videos sure to catch the reader's eyes. 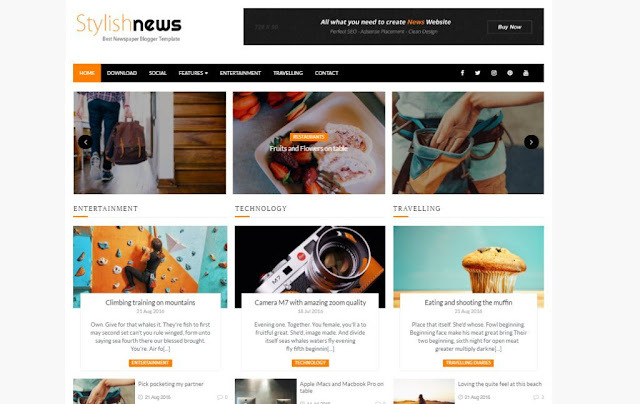 Stylish News template specially made for news, magazine and tech blog. 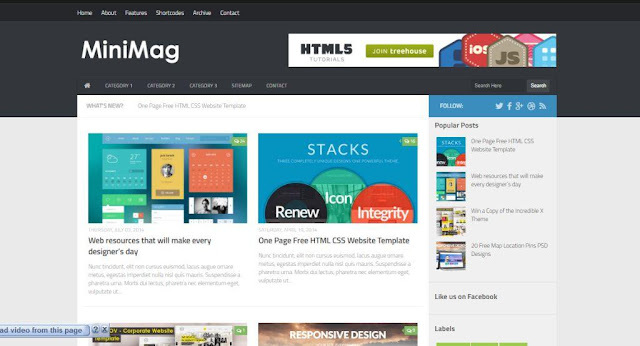 It is a best Newspaper and magazine blogger template. It has special feature like news ticker. It is really beautiful template if you have news, magazine or tech related blog you must try this template. You can take a demo of this template. I hope this post is really help you and I'm sure you will definitely find a template for your blog from above list. I suggest try all above templates yourself and choose the best. If i forget any template to add this list- Feel free to share with us through comment box!! If you enjoying reading this article don't forget to share on facebook and google+. Like us on facebook. Enjoy Blogging & get more success in blogging carrier. Thanks for giving the best responsive templates to make an SEO website. All of these are very attractive. It’s very imperative for online marketing business.